Here's a delicious 3 ingredient recipe for homemade spaghetti sauce. All that's required is cheese, cream and mushrooms/ or any vegetable of your choice. It's dee-lish-ous and super quick too! 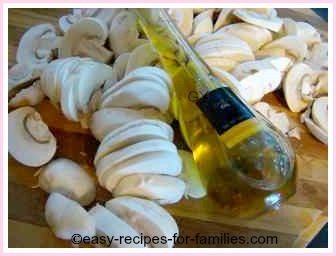 This is from our collection of quick easy recipes. Firstly put a large pan of water to boil with salt to cook the spaghetti. In a frypan or skillet, heat the oil till it starts to smoke. Add in all the sliced mushrooms all at once and fry till cooked. Do not season or it will sweat and your sauce will be too liquidy. Remove the mushrooms from the pan when cooked. Just check the pasta water - if it's boiling furiously, it's time to throw in the spaghetti to cook. Cook with the lid off with lots of salted water at full boiling temperature. Keep stirring the long spaghetti to keep the water moving around and loosening it. The pan should be nice and hot. Now tip in all the shredded cheese. Season with salt, pepper and chives to your taste and keep stirring so that the cheese melts and blends in with the cream. Serve immediately once the spaghetti is cooked. 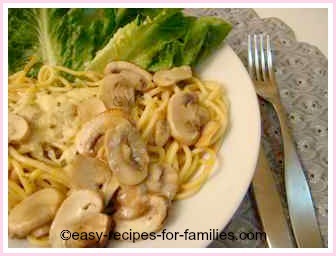 To serve this recipe, wind the spaghetti in circles onto a dinner plate, pour over the sauce and top with cooked mushrooms. Enjoy with lovely fresh salad greens. Now, if you're new to cooking and you feel you really need to see the photos of what each step looks like, just click on the photo here to take you to the photo tutorial. Mushrooms can be substituted with any vegetable or meat. I've used broccoli florets with bacon pieces and that was just sensational! Now, remember the trick with pasta is to cook it only just al' dente. This means it's cooked but still retains a tiny crunch in the center. Over cooked spaghetti is just a pile of mush so don't ever cook pasta ahead of time and leave it in the water till dinner time - it will be just soggy and awful. This recipe for a homemade pasta sauce is incredibly quick to make and you're more than likely to have the ingredients already in your refrigerator. We do... we always have cheese and cream in the fridge and some sort of vegetable. This recipe is not ideal to be cooked then frozen as the homemade sauce with cream will separate when frozen into milk solids and water. It's not a good look. Leave Recipe For Homemade Spaghetti Sauce to discover hundreds of delicious easy recipes!